The Fluhalp is situated at 2.620 m over sea level, right in the middle of the hiking- and skiing resort and is accessible in summer via Zermatt, Sunnegga Blauherd, or via the hiking track T舖chalp Sunnegga (see map). Starting point for the Oberrothorn 3415 meters, approx. 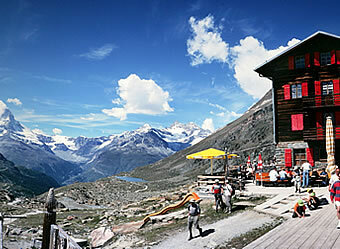 2 ｽ hrs – Highest hiking and trekking site in Europe.